Projects / Bang Out a Sweater: We’re Halfway There! Today may be celebrated by some as Valentine’s Day, but I’m even more of a starry-eyed romantic than that. For me, today is Day 14 of Bang Out a Sweater. Like many sturdy souls on Valentine’s Day and/or Day 14 of Bang Out, I’m not exactly where I want to be, but my heart is happy. I’ve reached the bottom of the yoke! The background is my Whitby pullover, which was knit in the same shade of Rowan Denim, but has been through 4+ years of washing and wearing. I did not reach this magnificent milestone without a moment of hair-tearing drama. Late Monday night, I was knitting on the very last row of the Calligraphy Cardigan cable chart. I was just starting to gloat, when I noticed I was missing a stitch in one of the repeats. Found it again, and spent an hour trying to pull it up and incorporate it correctly into the cable chart. Gave up, pulled back four rows, and re-knit. Which, honestly, is the thing I should always do when I discover a mistake like this, especially at night. Put it down, look at it again in the morning. Try to fix it, but be prepared to rip and re-knit. Knitting is my hobby. I like to knit. Re-knitting is not a problem. For those who are determined to try to fix a similar mistake when working cables, Jen Arnall-Culliford has a great little video that shows you how to do it. Up next for my Calligraphy Cardigan is a section of short rows to make the back neck fit nicely, then some increases to make room for the tops of the sleeves, and then a bit of plain stockinette. This gets you down to the place where you divide the sleeves from the body. If you’re knitting with Rowan Denim like I am, you will want to add 1½ to 2 inches of length before the sleeve-body divide. That way, the armholes won’t be too high after the shrinking of the denim. shrinkage at a glance: The swatch on the left is shown pre-washing. On the right is the same swatch, after washing. Is it that easy? Yes, it is! Rule of thumb when working with denim: add 15-20 percent in length to account for shrinkage. If there is shaping, distribute the extra length between the shaping points. So, in this case, I’ll add extra length before I get to the sleeve-body divide. Later, I’ll add extra length to the body, too. I’m trying to get to the plain knitting on the body before a sociable knitting opportunity tonight, so that I can keep banging out while I chat, instead of diverting to a project that doesn’t require as much attentiveness. 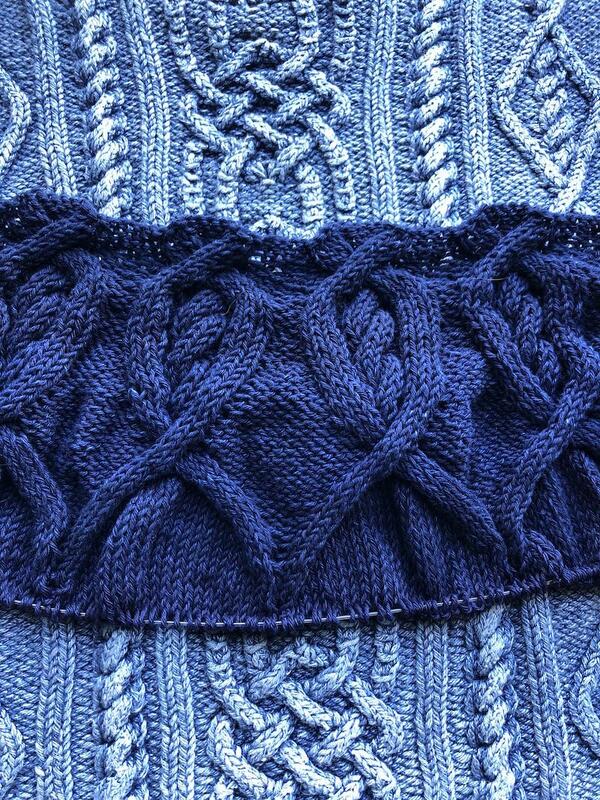 I’m loving all the sweaters taking shape in the Lounge and on Instagram, and I’m running to keep up/catch up. There's still time to get in on the wild ride of Bang Out a Sweater. Here's how! Yeah, I am not yet halfway there on my bangoutasweater project. But I am living on a prayer. That’s awesome! Crossing my fingers that you make it through the rest of the yoke with no problems. I’m about at the same spot. Just finishing the yoke. It’s been very slow going for me but I’m NOT giving up!!! Love your Rowan Denim!!! Yeah, me too, I love your washed Rowan Denim sweater. I’ve never wanted to knit one before, but I know I’ve got the pattern somewhere–and time is ticking on the yarn. I haven’t knit cables for quite a while so I’m not surprised that I’ve spent the first half of the month trying to fix mistakes but ended up ripping out the entire thing once and several rows a couple of times. It was a learning experience and I am now plowing ahead. I so hear you about reknitting! I noticed a dropped stitch ( well, a couple of ‘em) after an evening of knitting and wine. After trying to pick up and fix it – on row 40 something of the cables! – I decided to rip it all out, and restart with some reverse-engineered ribbing. I reasoned that I love to knit, and have a strong aversion to picking up stitches, so it was an excellent move. Don’t think I’ll manage to finish this before the end of the month, but now that I have one less area of stitches to pick up, it’s a sure finish before long. Thanks, mystery solved! I’m on row 13 of short rows, and taking it on faith ( it’s Norah, after all, and MDK!) that it will work just right. I am almost done with the short rows as well. And… it did seem that the markers were far apart. But I’m plowing along and figure that Norah knows best!!! I love the fade in your Whitby . 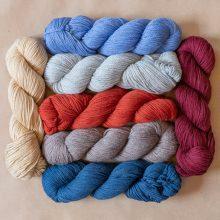 Random question…if I could find the Rowan denim and if I knit a Gansey…shrink allowance would be approx ????? Hi Donna, The shrinkage 15 to 20 percent no matter what you’re knitting. Halftime show will commence as soon as I organize the marching band!!! So did I interpret the instructions wrong? When I read 10 1/2 inches from the high point, I thought it meant from the top of the cables at the beginning of the piece. I only worked a couple of extra rows of stockinette before I divided the work. Do I need to rip back to there? How have others interpreted this? What is exactly meant by the highest point? Of what?Help!!! I’m not done with the short rows yet, but I think you are interpreting the pattern correctly. You measure the piece from the cast-on to the highest (or another way to think of it: deepest, longest) point, which is going to be in the center of the piece, where you have worked the most short rows. I don’t yet know how many rows I will need to get to the prescribed measurement, but that’s how I’m going to measure. Sounds good! I kept looking at the photographs and felt like I was on track, but you will be just a couple of rows short of the 10 1/2 inches when you finish the short rows. So you’re almost there! Thanks for sharing where you are and how you are proceeding. I am at the exact same place. Loved working on the cables! Now to work on the short rows and then down to the divide. I will add 2 inches – hope that will be enough for the second to largest size. What a fabulous trick! I see that you first published this almost a year ago, but for some reason I never watched it…….I’m so glad I did this time! Thank you so very, very much! Although I’m not banging out a sweater with you all this month, I’m cheering you on from the sidelines! YAYYYY! LOVE seeing all the progress on the bangout, even tho I’m unable to participate! The cable -correction video is priceless! 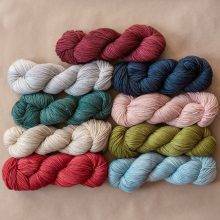 This (holiday) weekend I’m going on a knitting retreat with some friends from my local “Sip ‘n Knit.” Sooo glad to be on the stockinette part of the pattern, ‘cause there’ll be a lot of “sippin” with the knittin;)! Thankfully no dogs will be attending (speaking of knitting repairs—don’t ask…). I’m going away this weekend to sit by a friend’s fire and I plan to just powerknit the whole time! Great notes to save, and when I saw that photo of Whitby my heart did a little flip…the beautiful raison d’être of denim knitting! I need to make a fit correction to my Whitby (the neck is too wide and the weight of all that cotton pulls it wider) but even so I wear it almost every day this time of year, and my heart still flips at the sight. Inspite of a mistake in the one cable and ripping out 20 rows I just finished the short rows. There is a hope of finishing this by Feb 28th ( this year). Oh Kay, me too! 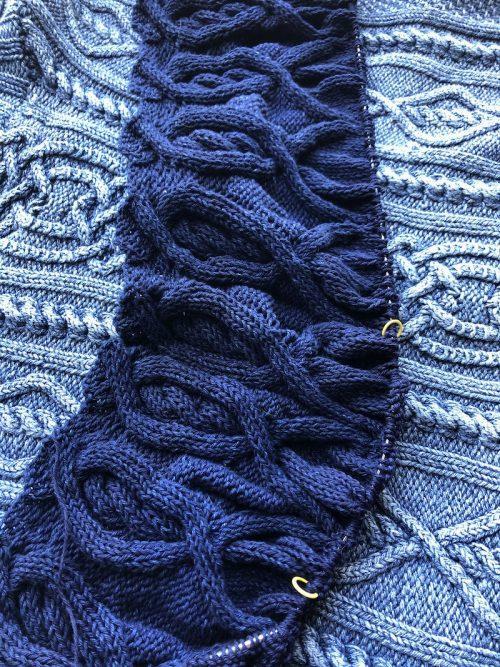 I was on the last stretch of the cable yoke section–THIS close–when I saw that I’d knit a purled row or purled a knit row on the wrong side and had a garter ridge on one edge, smack dab in the middle of where button one or two would be. So I ran each stitch down, fixed it and ran it back up. That worked except on the edge stitch. The edge was a lumpy mess. Time for bed. In the morning I started un-knitting, row by row. During that process I managed to lose a stitch or two; it took going back 7 rows to get to the point where I could start knitting again. That was last night. So, I’m running a little behind… but determined to get there. I’m really truly looking forward to that long stockinette stretch. I am on the rib section at the bottom and have decided to make it 2 inches instead if one to allow for the shrinkage factor if the denim. Hopefully will start on button bands by Saturday. My question is do I need to pick up more stitches since I have knit more rows? It seems to me that I should add some stitches on button bands to allow for the extra length but will it shrink the sand since it is basically sideways? You’re a little ahead of me, and you raise a good point. 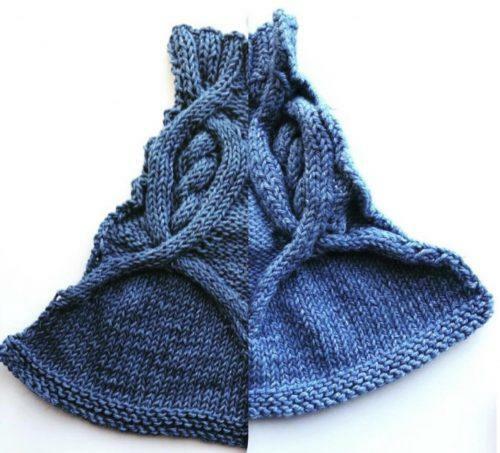 Yes, the length of the sweater will be longer in denim, because you’re knitting more rows. The edges will have more stitches from which you’ll be picking up. I think my approach will be to pick up the number of stitches called for by the pattern, with a possible addition of 10 percent of that number if it looks like it’s needed. Kate explains that generally, when you are picking up along an edge like this, you want to pick up 3 stitches for every 4 rows along the edge. I’m not going to double the ribbing at the bottom, because denim doesn’t shrink 50 percent in length. I’ll just add maybe 4 rows. Thanks Kay that’s good information and advice. I ended up making the lower band 1.5 inches and bound off just because I thought it looked good then. I’m also thinking about adding a short band around my short sleeves but haven’t quite decided yet. After trying numerous times to fix an enormous mistake in my cable within a cable, I gave up and frogged the whole piece, so I’m pretty much out of the February game. Ugh! At times like these it’s good to remember that We! Love! Knitting! (and also that it’s not a race). I am also banging the Calligraphy, in a pullover (probably 3/4 sleeves, but who knows? I may be too tired for anything beyond cap sleeves by 2/28), in Rowan denim! So, on 2/14, I was just a squeak ahead of you (just finished my short rows and increase row on 2/13) – now stockinette all the way, no worries about messed up cables while watching Victoria. It was my first time with denim, and also first time with significant cabling – my hands got a little achey from the extra tension I’m sure I was holding in my hands and arms and neck. I’m not crazy about how much of a hole the yarnovers were creating by going from cardigan to pullover – but I can’t face ripping all the way back – so, I’ll see if I can figure out a way to ‘sew’ them up after finishing, or, more likely, accept them as a totally intended part of the design. 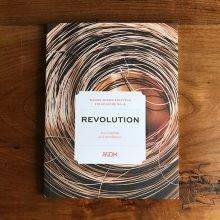 I am a zealous convert for Rowan denim – just as they are discontinuing it (sob!) Your Whitby above – so dreamy! This post is so helpful. 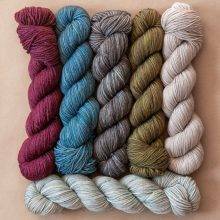 I have the Rowan denim and plan to make the Calligraphy cardigan. I wasn’t sure how to compensate for the shrinkage with the denim. Doesn’t sound hard at all! I admire those who can fix mistakes, I make bigger messes. Had to restart mine but I’m back to row 23. Just love the pattern!! The background sweater looks really pretty!